The damage of laser radiation to the human body is mainly caused by laser thermal effect, light pressure effect and photochemical effect.So eyes and skins are the protection key points.The laser product hazard classification is a defined index describing the degree of damage caused by the laser system to the human body. There are four grades,the laser used in the fiber laser cutting machine belongs to the class IV. Therefore, improving the machine’s protection level is not only an effective protection way for all personnel who needs access to this kind of machines, but also is responsible and respectful to the staff who operate this machine. 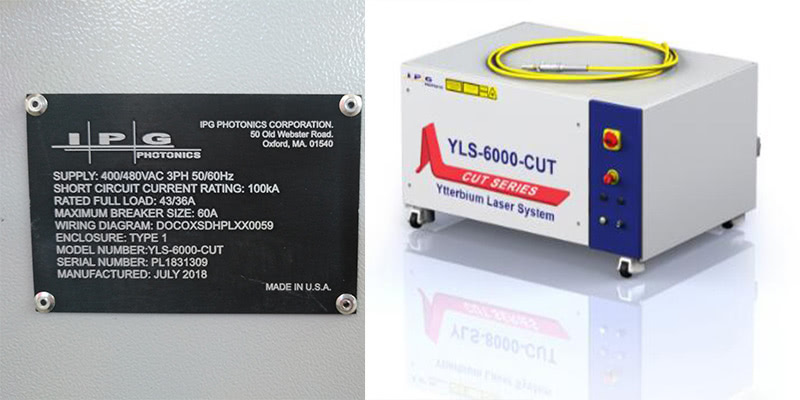 Now the laser power of fiber laser cutting machine is getting higher and higher,from the original 500W laser cutting machine to 15000W laser cutting machine, the rapid growing of laser power makes the laser protection become more important. Founded in 1992, Golden laser was always focused on laser machine manufacturing, and it has integrated laser product design, manufacture, sales and service.From the initial product design blueprint, the concept of safety first was injected. The fully enclosed pallet table fiber laser cutting machine was launched from this concept. 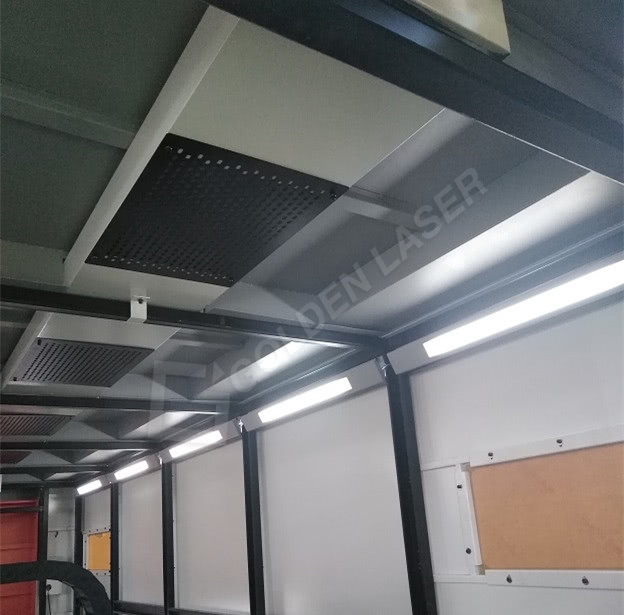 As you can see in the picture above, you are absolutely safe when you stand before this fully enclosed pallet table fiber laser cutting machine.The fully enclosed design allows all visible lasers to be blocked in the enclosed area. Meanwhile, in order to observe laser cutting dynamics in real time, the observation windows has been designed on the front and the side of the machine. The observation window uses the industry’s highest standards of radiation-resistant glass, and the window is large enough for you to see the cutting process. Even if you don’t have laser safety glasses, you can safely capture the “cutting beauty” of laser. The second design highlight of this machine is that we installed a high-definition camera at the optimal angle inside the enclosed area to make sure that the operator can observe the laser cutting process clearly while operating the machine. Meanwhile, the camera will present the clear and non-delayed monitoring screen to the operation table, so the operator can know the machine inside even while he is operating the machine. If the equipment has abnormal conditions, the operator can also effectively handle it in the first time to avoid further losses. During the laser cutting process, especially when cutting carbon steel and stainless steel, it will produce strong smoke and dust. If it is impossible to effectively eliminate these smoke and dust timely, a large amount of smoke accumulates inside the machine will cause a “smog” blind spot when you are observing the machine.And this may be what you are worried about. For this, we had considered it in the machine design. The cutting dust and smoke are blown by the gas in cutting, so it will spread in different forms and directions, but most of it will concentrated in the middle of the machine. According to the movement and flow of the smoke, the machine has been designed with top segmented dust extraction system. The dust-collecting holes are distributed over the machine top with multiple windows and distributions, and the machine has also equipped with a large wind turbine. Therefore, in the actual use, the dust collecting effect is very good. 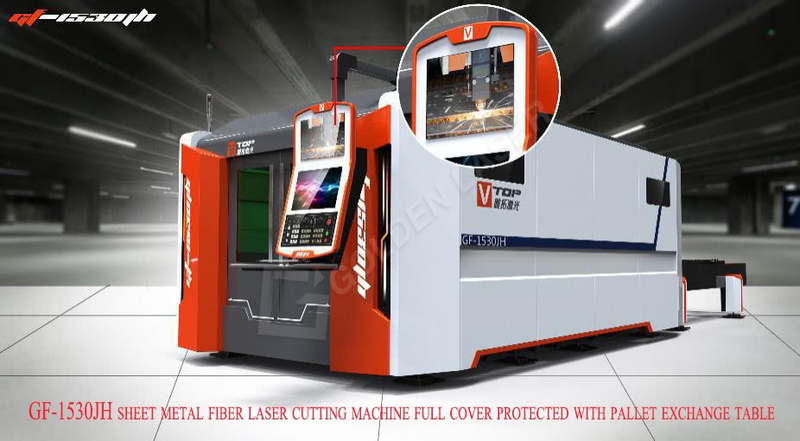 Once you understand our fully enclosed pallet table fiber laser cutting machine, you should be able to understand that it can help you to create value safely while you are using it for improving production and economic efficiency.